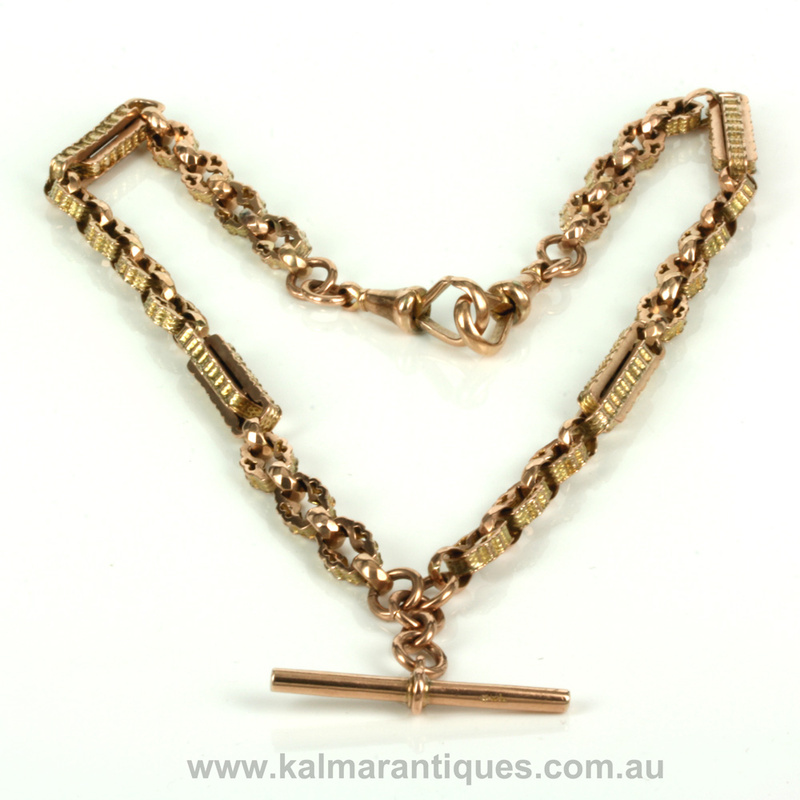 Antique Albert chain from the 1890's in gold. Product code: ES6043 Categories: Sold Items, Sold Jewellery. Originally designed for a gentleman to attach a pocket watch to the waist coat via a chain, the Albert chain, or Prince Albert chain as it is also known as was first designed in the 1800’s for Prince Albert. Designed to fit through a waist coat and hold a pocket watch on one end and the key to wind it on the other, they certainly made any gentleman of the time look rather dapper indeed. However in the early 1900’s with the increase in popularity of wrist watches, the gentleman of the house put these chains down and started to wear the wrist watch and now many years later, it is women who wear these around their necks. So although still able to be used to hold a pocket watch, here is an antique Albert chain that would look so elegant and regal around any woman’s neck. Made in the Victorian period of the 1890’s, this double Albert chain is made in 9ct rose gold in the most divine design. Made up of 4 sets of double bars, these bars themselves are wonderfully patterned and separated by facetted round belcher links and fancy oval links creating an exquisite chain. At each end are two swivel clips and in the centre the tee bar which used to fit through the waistcoat button hold similar to a cufflink. Measuring 44cm from end to end, this antique Albert chain is in perfect condition and can still be sol easily worn on a daily basis. A very elegant example of a genuine antique Albert chain.